After last year's garden and the all out war with the slugs, we decided that we really didn't want to take on that time consuming of an endeavor. But we still love some fresh tomatoes and a few other choice herbs & vegetables, so we planted, but we planted a lot smaller. However, after the Nashville flood in early May, our small garden became smaller when plants washed away and we were left with just tomatoes. Because you know what you make out of tomatoes? Be warned. 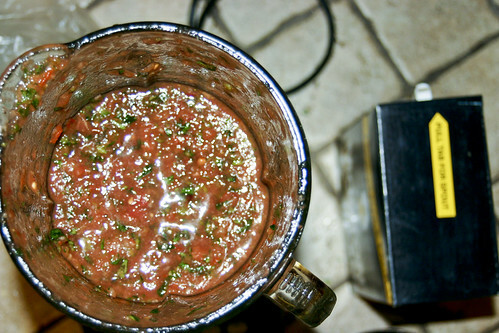 This made about 6 cups of salsa and filled my blender to capacity, so you may need to make it in 2 batches which is what I did this year. From this point, taste (with a chip of course!) and if you're happy, stop. If not, just start adding herbs & spices. The things I am most likely to add are salt, lime juice, cumin & maybe some chili powder if I'm wanting more heat. Always add less than you think you'll need as it's not so easy to take it out once it's in!! There's a good chance it will look pink for awhile. But that's normal and is caused by the air being pulled into the mixture while in the blender. To give the flavors a chance to blend properly and to allow your salsa to turn from pink to red and to "deflate", I prefer to put it in the fridge over night in an air-tight container. Grab a beer or margarita and dig in!!!! It is good straight out of the blender too. You're not required to wait. Are you a salsa dipper or scooper? I am definitely a scooper! The chip is merely the means in which to get the salsa into my mouth. It looks really yummy! I am a scooper as well! Scooper all the way. Gimme. Saved from the Goodwill Pile!